For spectators, athletes and organizers. Racemap streams your sports event live on the Internet, smartphones and Facebook. Show competitions live, record and replay later. Your sports event runs live in the competition player on smartphones, tablets and computers. You keep updated your fans along the race track, your organizing team and the moderation. And spectators all over the world can follow the race. In addition, the race is stored in Racemap and can be replayed later. Due to our Racemap » App for iPhone and Android live tracking is easy for you as an organizer. 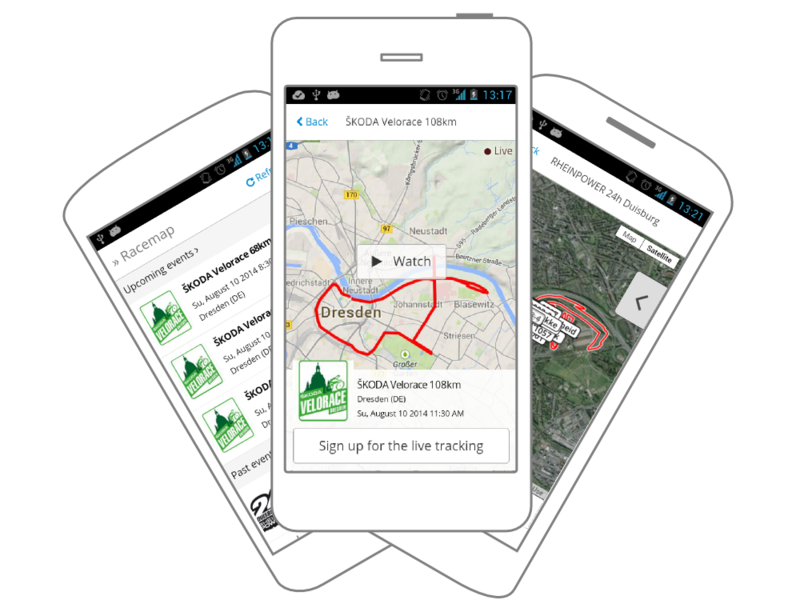 Your athletes get the free Racemap » App on their smartphone and join live tracking with name and race number - without registration. Racemap also supports live tracking with GPS-Tracker. Thus, for example visualizes the race of the leaders or the position of support vehicles. You can use Racemap flexible fitting to your event. You show your audience on the Internet the thrill of the running race directly on your website and Facebook page. In addition, you can show your spectators in the finish the Race on a large screen. To run your competition on Racemap, we only need Name of your event, the race track, date, start- and end time and a logo. And you only have to inform your athletes and spectators about your live tracking, so as many people as possible know about it. You want to present your sports event live with Racemap?